With the transition from sugar to high-fructose corn syrup as the primary sweetener in the USA, obesity rates have tripled and the incidence of diabetes has increased exponentially. The worst part? It’s everywhere. Check the ingredient labels of most processed foods and there’s a high likelihood that high-fructose corn syrup will be listed as an ingredient. This hyper-processed food product makes up 15-20% of the daily calorie intake of most Americans. You may already be avoiding high-fructose corn syrup, but here are some reminders about why this sweetener is dangerous for your health. High-fructose corn syrup can bring about conditions like diabetes, high blood pressure, obesity, heart disease, and even dementia when consumed at high levels. The chemical difference between high-fructose corn syrup and regular cane sugar is worse than you might think. High-fructose corn syrup is far more damaging to the intestinal lining – it kills off good bacteria, letting the bad stuff that causes the above conditions get into your bloodstream. The FDA doesn’t regulate a lot of the contaminants that go into the making of high-fructose corn syrup. The result is that the products used to manufacture high-fructose corn syrup leave it containing high and sometimes toxic levels of mercury. 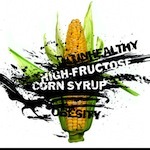 High-fructose corn syrup is a major component of highly processed “food-like substances.” If that sounds unappetizing to you, that may well be because food items that contain high-fructose corn syrup often also contain highly noxious byproducts, such as fats, chemicals, and high levels of sodium.